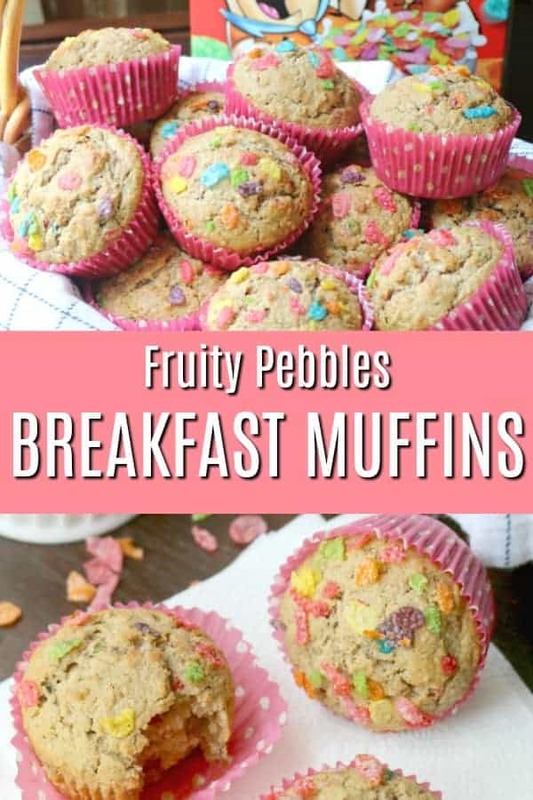 Easy Breakfast Muffins - Fun, Colorful, and Nutritious! 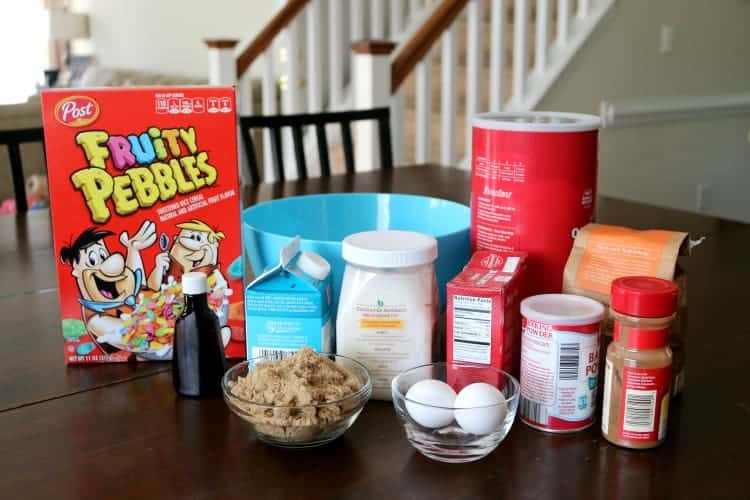 Quick and easy Fruity Pebbles Breakfast Muffins – a family favorite and the perfect grab-and-go breakfast or anytime snack! Great for a make-ahead breakfast. 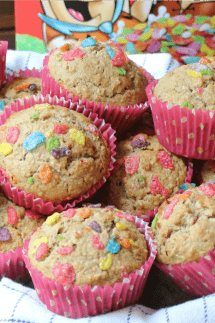 These fun, colorful, and nutritious breakfast muffins make both Mom and kids happy. I am excited to be working with Post Pebbles as a Blogger Ambassador! 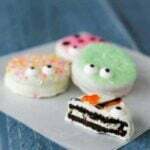 This blog post is sponsored by Post Pebbles, but all opinions and ideas are my own! We’ve had some struggles with breakfast lately. I think everyone is either simply worn out and ready for summer to begin or just tired of the same old same old every morning. One thing for sure is that we’ve been in a bit of a breakfast rut. Not exactly the best way to start the day with everyone is trying to get out the door to school. Our breakfast needed a bit of a makeover, so I turned to a family favorite recipe. This is a wonderful go-to base muffin recipe that uses simple ingredients and tastes delicious with any of your favorite mix-ins. The bright and fun colors from the Fruity Pebbles, might even make your kids forget that they are actually having a healthy breakfast! They will beg for this special treat! 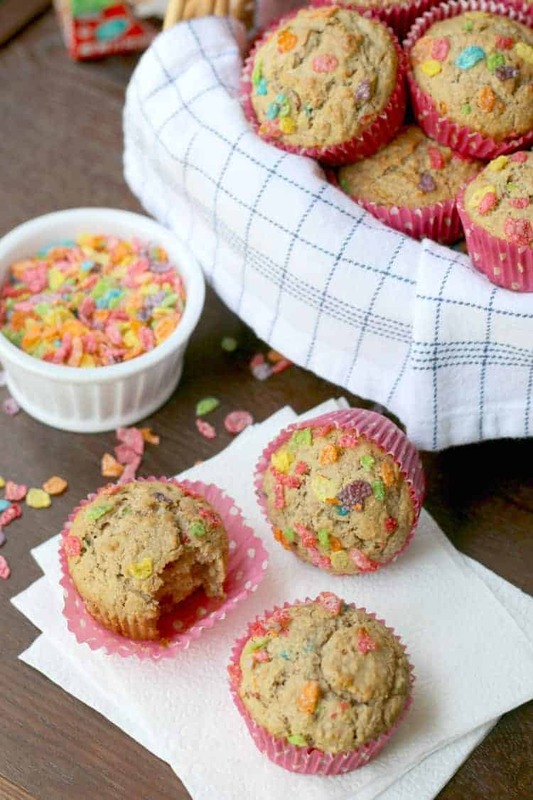 These Fruity Pebble Breakfast Muffins are not overly sweet. They are made with a blend of old-fashioned oats and white whole wheat flour, and they’re perfectly spiced with a hint of cinnamon. 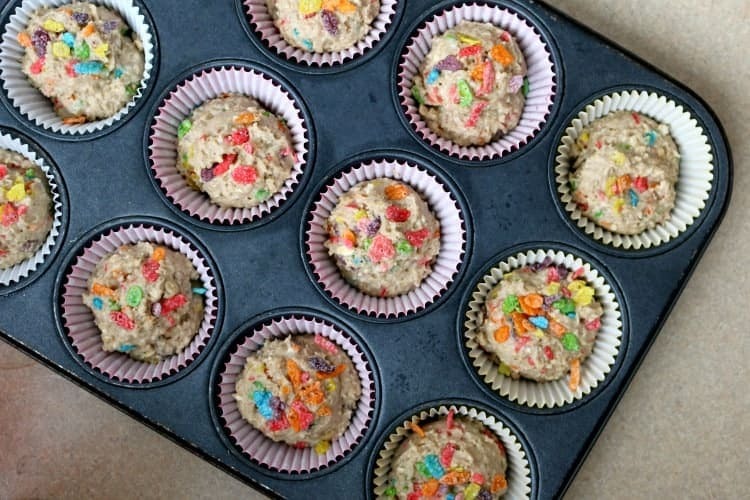 The Fruity Pebbles are mixed throughout the batter, and then sprinkled on top before placing in the oven. 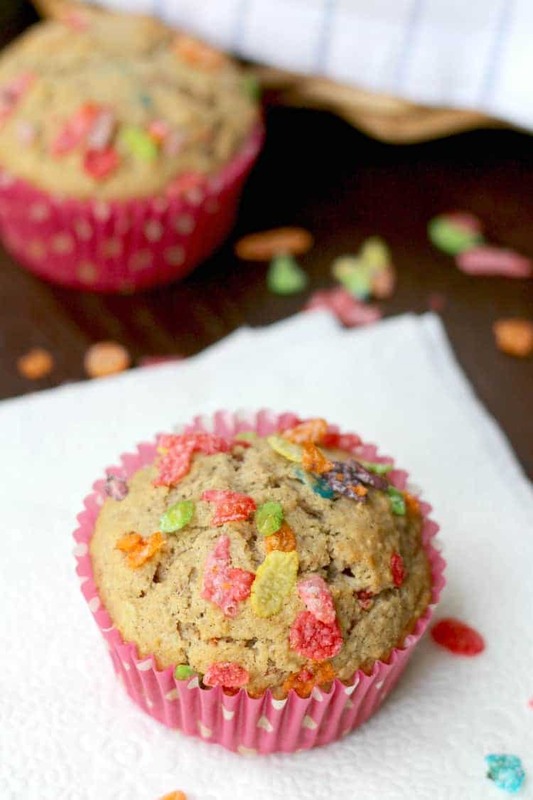 The result is a fun, colorful, and nutritious breakfast muffin that make both Mom and kids happy. I love this recipe because it’s so flexible. If you don’t have coconut oil on hand, you can use canola oil or even melted butter. I’ve used butter on occasion and the muffins turn out just as wonderful. If you don’t have buttermilk, you can sour your own milk. How do you sour your own milk? It’s actually really easy. Measure out 2 cups of milk, remove 4 Tablespoons, add 4 Tablespoons of white vinegar, stir, and then let the milk sit for about 10 minutes until you start to see it curdle. Wha-la…soured milk! The recipe makes about A LOT of muffins…about 24 of them. I like to keep some in an air-tight container and then wrap and freeze the rest. They freeze very well. So that’s it! Easy, right? 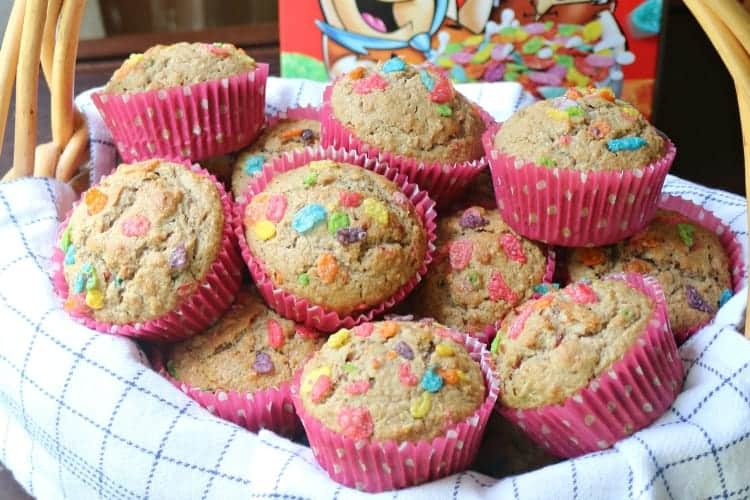 Whether you need an easy, quick breakfast for those busy school mornings, or a great snack for the kids in the afternoon after school, these Fruity Pebble Breakfast Muffins will hit the spot! In a large bowl, stir together ground oats and buttermilk. Allow to sit on counter for 15-20 minutes. Preheat oven to 400°F and line 2 - 12 muffin tin cups with muffin liners. 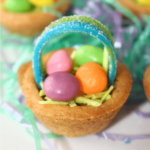 In a separate medium bowl, whisk together flour, baking soda, baking powder, salt, and cinnamon; set aside. After oats have finished soaking in buttermilk, add brown sugar and eggs into the mixture and stir thoroughly. Mix in melted coconut oil and vanilla. 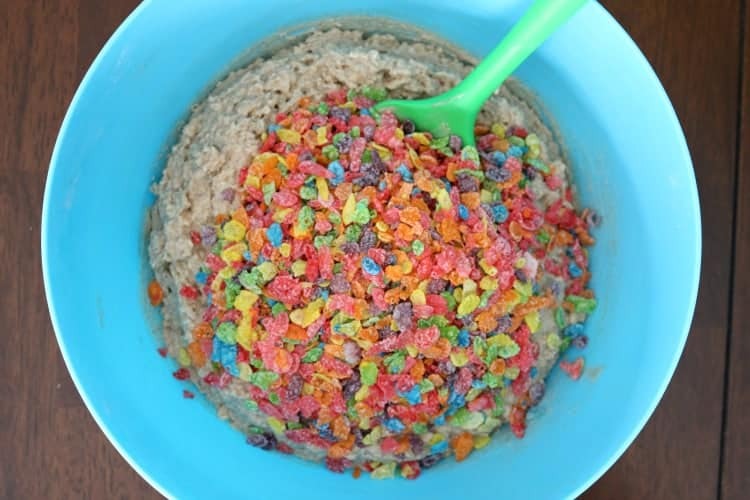 Blend in flour mixture and Fruity Pebbles until just combined. Divide batter between prepared muffin cups. Sprinkle top of each cup with a few additional Fruity Pebbles. Bake for 18-20 muffins or until tops of muffins are golden brown and toothpick inserted into middle of muffin comes out clean. Cool muffins in pan for a 5-10 minutes before place on cooling rack to finish cooling completely. *Keep in an air-tight container for 1 week. **Muffins freeze well. Wrap muffins individually in plastic wrap and then place in freezer bag. Will keep for up to 3 months. 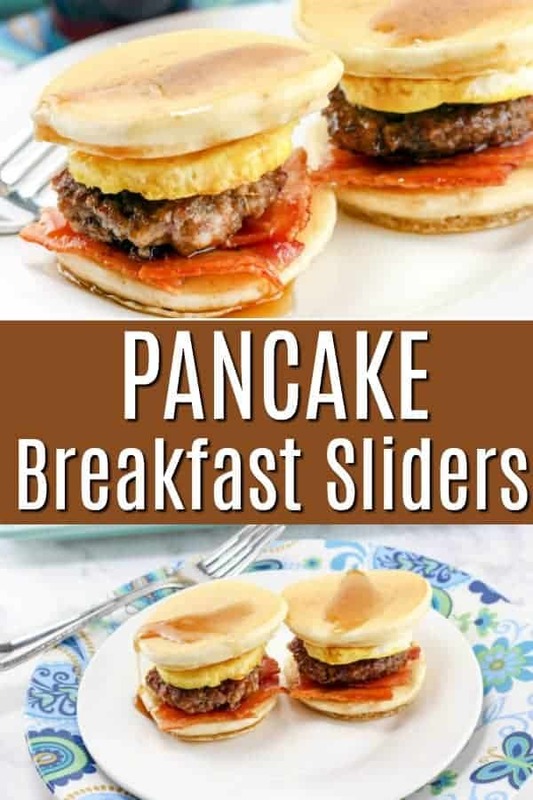 Pancake Breakfast Sliders – The delicious sweetness of the pancake and the savory bacon and eggs creates the perfect combination for an easy breakfast recipe that your friends and family will love! Nutella French Toast Roll-Ups – quick and easy to make and a fun, finger-friendly treat for breakfast or brunch (silverware optional). And did I mentioned Nutella is involved in this recipe?